DSS Check In is an application specifically designed to improve office efficiency in health departments, WIC programs and the department of social services. Using an Apple iPad, the sign in app gathers information and organizes the visitors by department and reason. Arrivals are accurately time and date stamped, organized and then displayed directly on the office computers. Staff can then acknowledge and checkout each person as they are attended to leaving a trail of accurate times and names of who, when and how long they were serviced. Budgets leave very little or no room for receptionists. 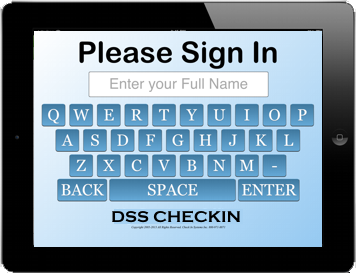 DSS Check In will reduce receptionist workload or even replace them so they can move on to more important tasks. Visitors can sign in and select their department and needs on the kiosk. The kiosk will sort the peoples needs, organize them by time and notify your staff at their desktop. DSS Checkin will date and time stamp each step of the process. Arrival, Acknowledgement and dismissal. From these times and the reasons for visit, DSS Check In will analyze and report on the traffic flow, wait times and staff performance. Your data is kept long term so you can compare from year to year or day to day. It's never been easier to get started! Check In Systems is now offering a free 30 day subscription to probation offices across the country. All you need is an Apple iPad and we'll get you started. So simple to setup, you'll have a check in system within minutes. We can walk you though the setup over the phone or send you easy to follow instructions. There's no obligation.